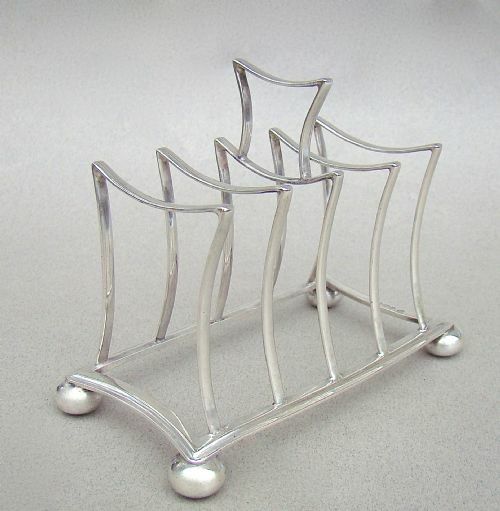 This unusual and very elegant silver five division toast rack is dated Birmingham 1905. 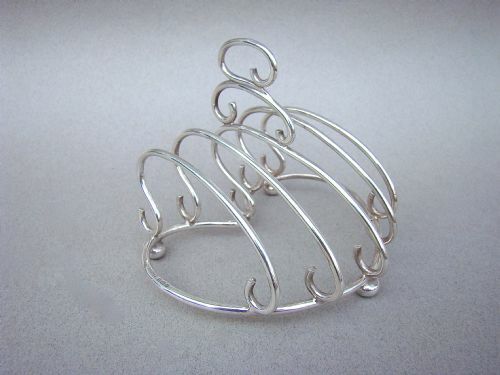 The heart-shaped base with five scroll wire-loop divisions and raised on three ball feet. The central division with conforming loop handle. Excellent silver gauge. Height including handle: 8.5cm / 3.4 inches. Weight: 113g or 4 oz. 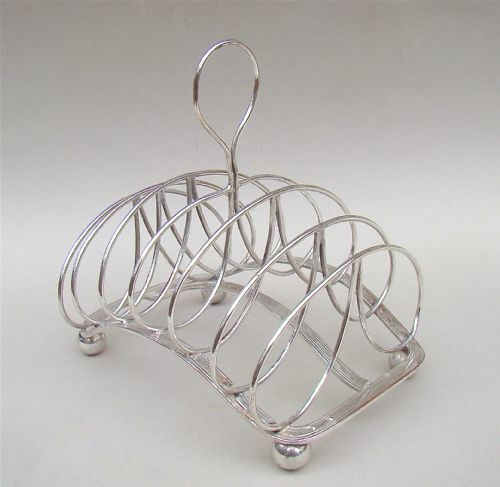 This unusual and very elegant silver five division toast rack has very generous proportions. The rounded rectangular base base with five reeded flat divisions and raised on four cast bracket feet. The central division with conforming loop handle. Excellent silver gauge. Date letter "s" for 1933. Weight: 151g or 5 1/4 oz. 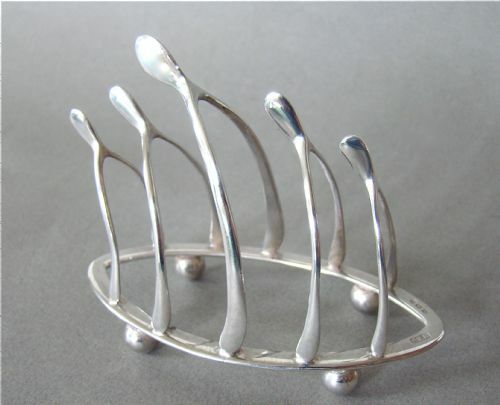 This fabulous nine-bar solid silver toast rack is dated Exeter 1808. 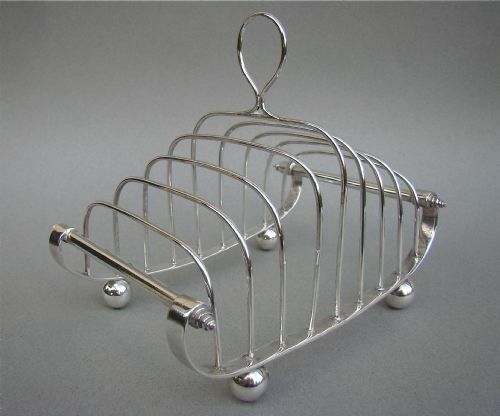 Georgian toast racks are very sought-after and provincial ones are very scarce. This is a beautifully designed piece. It is a large example, weighs over seven ounces and looks incredibly elegant. The sleigh-shaped body resting on four ball feet. The base with nine wire-loop divisions. The central bar surmounted by a simple loop handle. Date letter "M" for 1808. Length: 15cm / 6 inches. Height including handle: 12.5cm / 5 inches. Weight: 215g or 7.6 oz. Minor silver repair on base of one of the loops, very nicely done., barely noticeable. This superb seven-bar solid silver toast rack was made by Edward, John & William Barnard a highly regarded silversmith family and is dated London 1829. 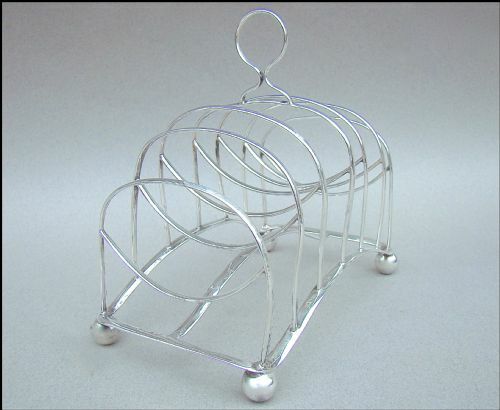 Georgian/Regency toast racks are very sought-after and this is a beautiful example by very collectable silversmiths. The rounded rectangular base with seven arched wire-loop divisions and raised on four shell bracket feet. The central bar surmounted by an oval handle. The handle flanked by two stylised wings surrounding an oval reserve. It has a very good gauge weighing over 10 ounces, a testimony to its fine quality. EJ B EW for Edward, Edw Junior, John & William Barnard. Date letter "O" for 1829. Length: 16cm / 6.2 inches. Height including handle: 12cm / 4.6 inches. Weight: 293g or 10.3 oz. This superb seven-bar Georgian solid silver toast is dated Sheffield 1811 Georgian toast racks are very sought-after and this is a beautiful example. The concave rectangular base with seven arched wire-loop divisions and raised on four ball feet. The central bar surmounted by an oval handle. Date letter "c" surmounted by a crown for Sheffield. Height including handle: 14cm / 6 inches. 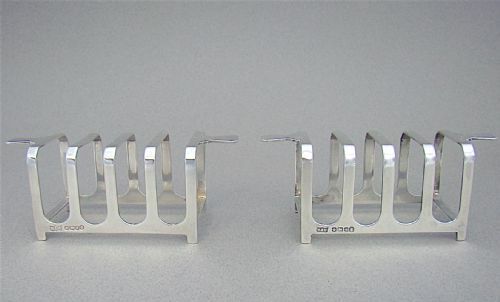 This exquisite solid silver "lucky" wishbone toast rack was made in Birmingham 1926. This wishbone design is very sought-after and relatively rare. The navette shaped base raised on four ball feet. CTB for C T Burrows & Sons. Date letter "B" for 1926. Height: 8cm / 3 inches. Width: 4.5cm / 1.6 inches. Weight: 62 g / 2.2 oz. 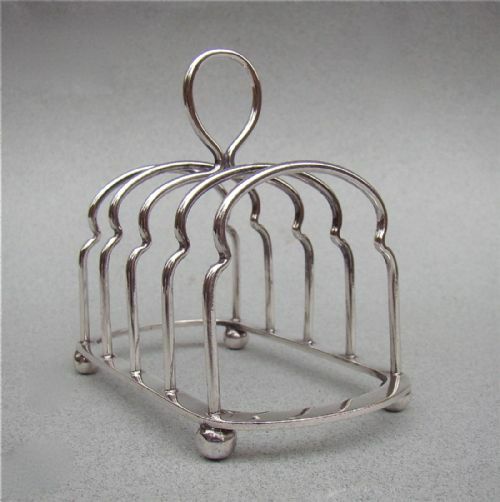 This superb seven-bar Old Sheffield plate toast rack was made circa 1820. 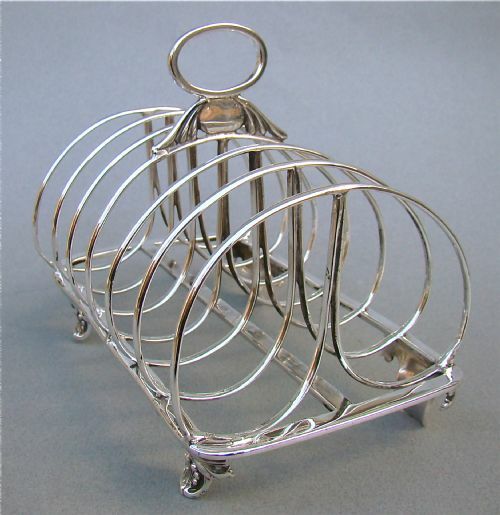 Georgian/Regency toast racks are very sought-after and this is a beautiful example. The concave reeded rectangular base with seven arched wire-loop divisions and raised on four ball feet. Date letter "s" for 1920. Combined weight: 102g or 3 1/2 oz. This is an exquisite and unusual silver toast rack made by the collectable silversmiths Hukin & Heath and dated London 1900. The rounded rectangular base with five arched wire-loop divisions simulating the shape of a slice of bread. Date letter "e" for 1900. Height including handle: 8cm / 3 inches. Weight: 77g or 2.7 oz. 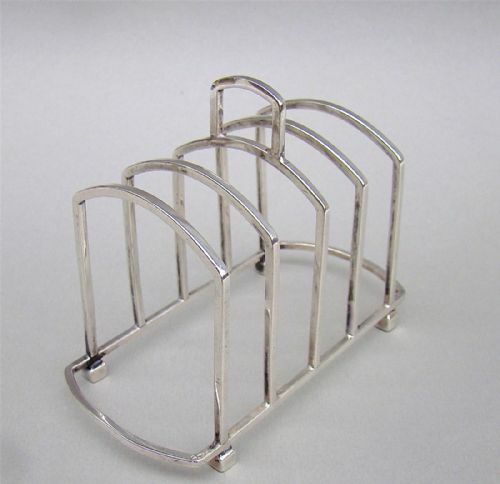 This is a very elegant and distinctive solid silver toast rack made by the renowned Martin Hall & Co dated Birmingham 1920. The slightly convex rectangular base with five arched square shaped wire-loop divisions and raised on four distinctive square shaped feet. MH&CO LTD for Martin Hall & Co. Date letters "v" for 1920. Weight: 98g or 3.4 oz. 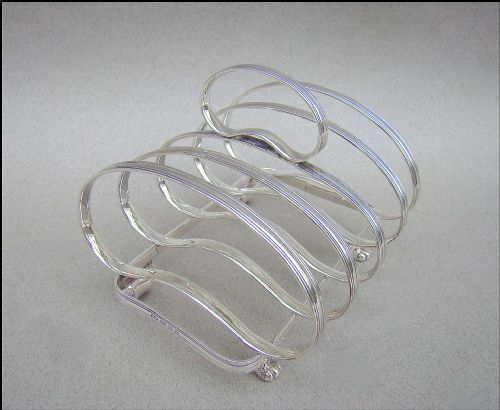 This is a very elegant and distinctive solid silver toast rack made by William Watson & Herbert Gillott and dated Sheffield 1901. The rectangular base with five shaped wire-loop divisions and raised on four bun feet. Date letters "t" for 1901. Height including handle: 9cm / 3.4 inches. Weight: 100g or 3.5 oz. 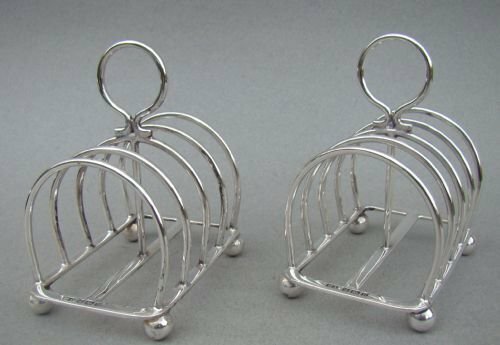 This is an exquisite pair of small silver toast racks made by the prolific Atkin Brothers and hallmarked for Sheffield 1912. The rounded rectangular base with five arched wire-loop divisions and raised on four ball feet. HA for the Atkin Brothers. Date letter "u for 1912. Height including handle: 7.5cm / 3 inches. Combined Weight: 99g or 3.5 oz.